First Round shares a morning commute with one LBO player's personal black cab. 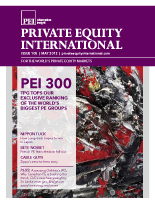 The world’s only like-for-like ranking of private equity direct investment programmes highlights how capital flows are changing. The prospect of the first Socialist president for 24 years, coupled with continuing uncertainty over the fate of the euro, has led to a marked slowdown in French private equity, writes Oliver Smiddy. Thanks to SEC registration filings, some past disciplinary actions have emerged publicly for the first time. That’s good for LPs and the industry as a whole, writes Christopher Witkowsky. Warburg Pincus and Cinven created Dutch cable company Ziggo from three regional players in 2007. In March it became the biggest European IPO for nine months. James Taylor reports. Nicholas Pye explores the fundraising circuit.